GoSort! is a human sorting algorithm game with mechanics similar to Go Fish. It can be played by two to four players. The object of the game is to hold the complete, sorted deck in your hand. I developed this for my Games & Art class. It is still in its infancy. Each player receives seven cards, the rest remain in the deck. Turns go clockwise around the circle. The game ends when one player holds a complete sorted deck. If something prevents this from happening, the game should be replayed from the beginning. During a player’s turn, he/she may ask one other player if that player holds a particular card (the 5 of Hearts, for instance). If the other player holds the desired card, they must hand it over along with any other cards that are “sequential” with the one that was requested. (See more on “sequential” cards below). If the other player does not hold the requested card, the player takes one card from the deck. In either case, the player does not go again until every other player has had a turn. 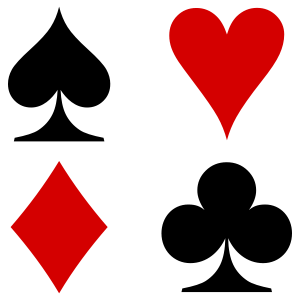 SEQUENTIAL CARDS: Players should order the cards in their hand in the following manner: Hearts then Diamonds then Clubs then Spades and from Two to Ace within each suit. Sequential cards are ones that touch one another within this ordering. So if a player is asked for a 4-D (4 of Diamonds) and their hand contains: J-H, K-H, A-H, 2-D, 3-D, 4-D, 6-D, they would have to hand over everything except for J-H and 6-D.
That’s how GoSort! is played. This sorting algorithm isn’t nearly as efficient as a computational sorting algorithm such as MergeSort or QuickSort, but hopefully it is more fun. This entry was posted on October 4, 2010, 9:22 am and is filed under Games and Art. You can follow any responses to this entry through RSS 2.0. You can leave a response, or trackback from your own site.